If you think that woodworking is a passion, and not just a mere profession or a hobby, then you share the same way of thinking as many woodworkers on the planet. It is with this thought that you need to have the best equipment to give you accurate and speedy cuts with smooth finishes. Regular handsaws might do the job, but technology has already been magnificent regarding the cutting of wood. As such, we have been introduced with the miter saw, and if you have such a machine, then you need the best miter saw blades. With such a woodworking machine at your disposal, you can create custom cuts on your wooden boards. Saws blades for your miter saw can have multiple purposes, such as giving you 45-degree cuts (i.e. for picture frames) or create cuts on wide boards, or perhaps they're good enough to be your partner for pallet projects. If you choose a low-quality miter saw blade, then expect the results of the cut to be subpar. The resulting smoothness won't be as smooth as you'd have hoped, and the blade might even get chipped, dented, bent, or damaged in a short amount of time. While high-quality miter saw blades might cost more than the regular kind (and even more so if you want to compare with cheap quality blades), you're going to invest in the better future of your woodworking projects. Are you perusing the market for the best miter saw blades that you can purchase right now? Then we've got the information you seek in this guide. I work with a woodshop owned by a friend of mine, and we've been going at it for many years now. I use my miter saw to help me create particular wooden masterpieces, such as intricately designed frames. When I glance at the look of joy on the faces of our customers because of the work that we do, it gives me the motivation to move on, despite sometimes I think that my miter saw blade is about to give up on me. I'm hesitant to purchase any other miter saw blade brand as opposed to the one I'm using because I'm already used to it. It's been like this for some time now until a colleague told me that he found a better one, albeit it does cost more than what I would usually spend for my saw blades. The blade was from a famous brand, and I went through with it just to test it out. What happened next was no mere testing as I instantly fell in love with my purchase. The surfaces of the cuts were incredibly smooth, and I no longer have to use any sanding on them. Also, cutting wood is now faster I couldn't even believe my eyes as I was able to accomplish more than a day than before. I just wished I wasn’t so stubborn and went ahead to purchase such a marvelous miter saw blade rather than sticking with my cheap model. Otherwise, I would've been able to finish more before as compared to now. When you look inside the miter saw blade market, you might be confused as to what to get because of all the choices that are available for you. One of the options that you should consider is the DEWALT DW3106P5 60-Tooth Crosscutting and 32-Tooth General Purpose Saw Blade Combo Pack. It is made with a thin kerf to deliver fast, smooth, and accurate cuts. The plate is computer balanced to reduce potential vibrations while under operation. Its tungsten carbide material is highly durable, which means that you're going to get a lot of work done with this blade for a very long time. The Freud LM72R010 Heavy Duty Rip Blade presents itself to be at the second spot on this guide, but it doesn't mean that it's not any good as the first choice. With its heavy-duty metal construction, it can deliver fast rips, as well as a glue-line with high accuracy. It is suggested to use this on ripping woods, chip boards, laminate, and plywood. The third place goes to the Forrest CM12806115 Chopmaster 12-Inch 80-tooth ATB Miter Saw Blade, and it can help you save about a third of wood loss per cut. Feeding wood into this miter saw blade is as easy as it can be. It can be used for light to moderate use, so those who are dealing with heavy-duty tasks might want to look somewhere else. A quality miter saw blade is for woodworkers that are looking to get sharper, smoother, and more precision cuts as compared to using conventional blades for their miter saws. Think about this - if you're going to use low-quality blades, then you might not cut wood or other materials in a quick manner as you'd have initially hoped. Furthermore, using cheap saw blades can give you subpar finishes. Hence, you're going to have to clean the mess up by sanding the surface before you move on to the succeeding step in the woodworking process for the item. But if you do have a high-quality saw blade for your miter saws, then cuts will be smooth, so you don't have to deal with the extra effort in sanding or polishing the results. In doing so, just having the good quality saw blade can help you save a lot of time, and perhaps even a lot of money in the long run. Cheap blades are known to break easily, so you have to purchase a new set pretty soon. High-quality miter saw blades, on the other hand, will last a good long while (provided that there is proper cleaning, maintenance, and storage involved). When you ask veteran woodworkers, the might have varying opinions regarding the number of teeth on the blade and which of them is optimal for use. Some will say that teeth should be at least 60 to provide a nice, smooth cut. However, there are some who might disagree with this notion. It will depend on what you're going to cut when choosing which miter saw blade to purchase. When you buy a saw blade that has approximately 24 teeth, then it is best for doing rip cutting on natural wood. For those models that have at least 60 teeth (preferably 80), then these are excellent for cross cutting on natural wood. Variants that have a teeth count of somewhere around 40 to 50 are called combination blades, and they can do both cross and rip cutting operations. What is a hook angle about miter saw blades? These are the angles between the center of the blade and the edge of the tooth. It is also commonly known as the blade's label. The more positive the hook angle of the blade will be, the greater it has the tendency to become too "grabby" towards the substance being cut. When searching for excellent miter saw blades, also consider its tooth geometry. It is about the way the tooth of the blade is being cut. You might want to consider getting a saw blade with a Tripe Chip Grind (TCG) because such a model can give you an astoundingly smooth cut. The DEWALT DW3106P5 60-Tooth Crosscutting and 32-Tooth General Purpose 10-Inch Saw Blade Combo Pack promotes an ultra-thin kerf, and it can be used for both table and miter saws. This pack contains two blades right at the get-go, and they both have the same characteristics. Both of these blades have a 10-inch diameter, a +5 degree hook angle, an alternate top bevel, a .071-inch plate, and a .097-inch kerf. These blades are geared for general purpose use, and they are excellent saw blades to have for all-purpose cutting needs. They can cut through plywood, natural wood, and wooden composites. The only difference between these two blades is the teeth counts as one has 60 teeth and the other has 32. Nonetheless, both models offer quick and even incisions to your preferred material. While there are some low-quality miter saw blades on the market that don't deliver in the field of straightness, DEWALT's DW310605 blades can certainly make the cut (no pun intended). Incisions are superbly smooth, and you can even run your finger across the newly cut surface to test it out. These blades are made out of a tough tungsten carbide, which means that they can last a good long while. Furthermore, it is with such a construction that the blade won't jiggle or wiggle a lot during operation (if there are such movement). It promotes a vibration-free design and material so you can have straight and smooth cuts at a consistent rate. The DEWALT DW3106P5 60-Tooth Crosscutting and 32-Tooth General Purpose 10-Inch Saw Blade Combo Pack is an excellent product to purchase for casual to moderate woodworking projects. It is durable, sharp, and it promotes a lot of advantages that many woodworkers are searching for in miter saw blades. While it can cut a lot of wood, it might not be an ideal choice for cutting tough plastic as it can wear down the teeth pretty quick. The Freud P410T 40 Tooth Thin Kerf Premier Fusion General Purpose Saw Blade can be used for heavy-duty cutting and ripping. It can handle many types of woodworking projects with ease. It is made of TiCo Hi-Density Carbide, and it also has triple chip tooth geometry to provide smooth finishes. The blade is made with Laser-cut Anti-vibration vents to ensure that it will stay as stable as possible, even while under heavy operations. 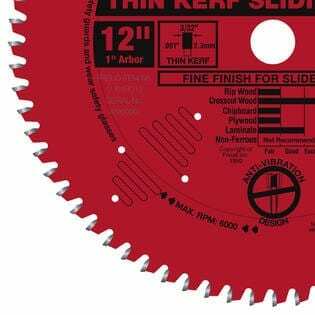 It is recommended to use this miter saw blade when ripping wood, plywood, and laminates. It is made with a non-stick perma-SHIELD coating for extra protection against gumming, pitch buildup, and corrosion. The vents also allow for a reduction in noise while you're working with it with a miter saw. Using miter saws, and even with other woodworking machines, offer a lot of noise, which is why many woodworkers opt to wear protective headsets to shield their ears from harm. With the Freud P410T, it promotes a quieter operation because of the laser-cut vents built into it. These vents also allow the blade to stay as stable as possible while cutting wood. Whether you're cutting plywood or laminates, each cut will come out smooth and accurate. Therefore, no further fixes need to be done on your material, and you can move on to the next step of the process. In doing so, you can save precious time and money. While the Freud P410T Premier Fusion General Purpose Saw Blade does promote optimal sharpness as it can give you excellently smooth results, it can have a bit of trouble in cutting certain types of hardwood. But for its price and for what it can do, it can do it well. Wood that it can cut will have very smooth surfaces, and it can even be used to cut laminates. The Freud LM72R010 10 In. 24 Tooth miter saw blade is made with heavy duty material to promote optimum levels of sharpness and durability. It can quickly rip through wood and other materials, and it can also make glue-line precision cuts. The blade is made out of a TiCo Hi-Density Carbide material that can help the product last a very long time (as long as proper care and maintenance are observed), and it also has a flat tooth design that can produce superbly smooth finishes. It is recommended to use this blade for ripping wood, plywood, chipboards, and laminate. It is also made with a non-stick Perma-SHIELD coating to help extend its life as it can protect the blade from gumming, pitch buildup, and corrosion. The Freud LM72R010 offers glue-line precision cuts with an anti-kickback design. It can produce quick cuts on wood, and it can deliver them with its heavy-duty rip saw blade. It can deal with light, moderate, to heavy-duty use. It can even be used in gang-rip operations. It is a versatile blade that can handle crosscuts with plywood, chipboards, and laminate. This particular miter saw blade has an excellent level of balance to provide stability when cutting, even during heavy-duty operations. As such, the cuts will come out as accurate and as smooth as you'd have initially hoped. Despite the Freud LM72R010 10 In. 24 Tooth Heavy Duty Rip Blade lacks a teensy bit in the durability department; it is still sturdy enough to handle a lot of woodworking projects. The blade's carbide material does a pretty good job in providing sturdiness and sharp cuts. Cuts are very smooth (which you'd want in a high-quality miter saw blade), and it does present itself with excellent balance as it doesn't wobble during operation. The Freud 12 LU91R012 In. 72 Tooth Sliding Miter Saw Blade has a thin kerf design to provide smooth finishes for cuts. It is made for sliding miters and radial arm saws, and it promotes a fast feed rate. Because you can feed it wood and other materials pretty quick, it takes less effort and power to finish woodworking projects. This particular saw blade can be used to rip wood, chip boards, laminate, and plywood. It can also be used in crosscutting wood. It has a negative hook angle to minimize climbing and promote better balance and control. It is suggested to use this saw blade on materials that have a thickness of 1/2-inch to 2-3/4 inches. It also comes with a Perma-SHIELD nonstick coating to protect against gumming, corrosion, and pitch buildup. Its non-stick Perma-SHIELD coating is not only for protecting the blade against corrosion, gumming, and pitch buildup, as it is also excellent in reducing friction and heat buildup during operations. It has a lubricating functionality that allows the blade to spin as freely as possible to reduce stress on the motor. The blade's thin kerf allows its 72 teeth to help the blade maintain a sharp cutting edge, even after constant use. It can even stand through very demanding applications, and the material is highly durable as it is advertised to contain a higher density of tungsten carbide than most other TiCO blends. The Freud 12 LU91R012 is an excellent miter saw blade, but it does come with some shortcomings. For instance, its design and construction might not help it fit some saws on the market, like the Rockwell Sawbuck Frame. But if you do have a miter saw that is compatible with this blade, then you're in luck because you're going to get a high-quality saw blade that can give you the results you require for a very long time. While there are many miter saw blades on the market, many models will chip away wood like there's no tomorrow. 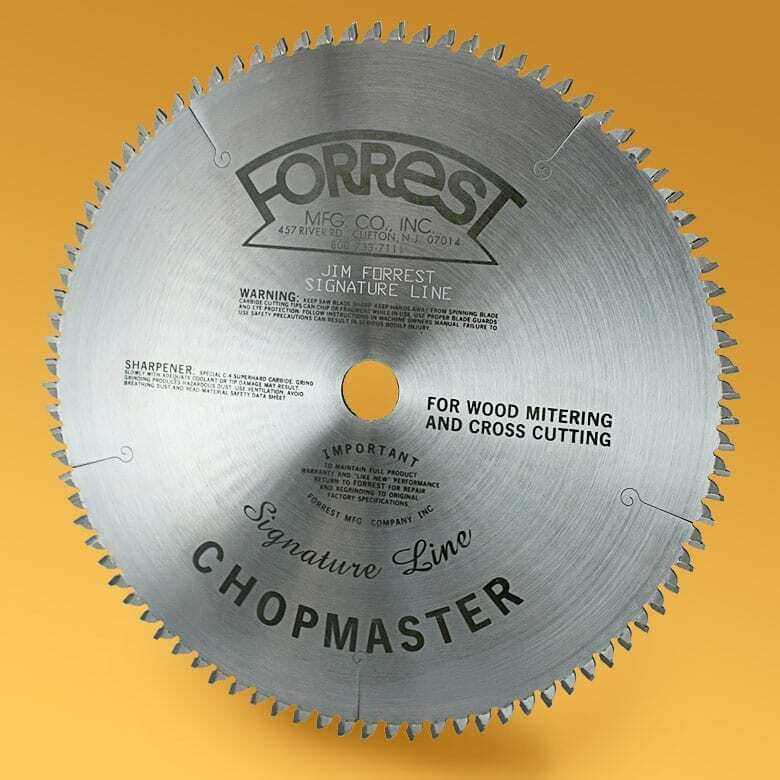 With that being said, the Forrest CM12806115 Chopmaster 80-tooth ATB Miter Saw Blade take a different approach to that regard as it allows you to save about 1/3 wood with each cut. You can also feed it wood and other materials easily, and it can be used for moderate crosscuts and rips when used on a table saw. This particular miter and table saw are excellent in handling bottom splintering so that you can achieve radial crosscuts. It has a 30-inch ATB tooth design, which means that the blade will stop immediately on demand. When looking at the back side of plywood after cutting it with this blade, you will notice zero tear out. Even if you make it tear through thick pieces of wood, such as an 8/4 oak, it will still feel like a hot knife going through butter. Furthermore, the surfaces made from the cut are glass-like and positively smooth. While there are other miter and table saw blades that will require you to bring out a bit (or a lot ) of effort just to make it feed wood, this particular model presents effortless feeding. Once you start feeding it wood, it won't stop until it passes through. However, if you do want to make it stop, its 30-inch ATB tooth design will halt the blade on demand. The blade is very sharp. It can cut through wood effortlessly. Unlike other miter saw blades that won't hurt your budget too much, you'd best be prepared if you want to purchase the Forrest CM12806115 Chopmaster 12-Inch 80-tooth ATB Miter Saw Blade. This blade has a hefty price tag, and those who are left unprepared might just look the other way and never come back. But if you do decide to get this miter and table saw blade, you'll get what you paid for. It presents excellent value for your hard-earned cash as it presents many features that are very likable. I've already been searching across the market for a good set of miter saw blades, and I've come across many websites that say they offer the "best of the best." However, I wasn't sure if they can provide me with the cut I'm looking for as I'm quite passionate about my woodworking projects. Upon reading these low scored reviews, I noticed that some users would use the blade for heavy-duty use. These are nice cutting blades, but I know that they're not for constant day-to-day use, which is excellent for me because I'm just a casual user. 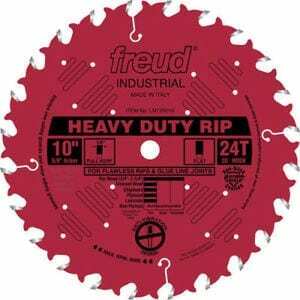 The Freud LU85R010 80 Tooth Ultimate Cut-Off Saw Blade doesn't have the "ultimate" moniker for nothing. The blade's teeth will polish the material of anything it cuts. Ergo, it will provide a very smooth finish, similar to the texture of glass. It also has Laser-cut anti-vibration slots to eliminate most, if not all vibration during operation, which would otherwise be a common problem for standard saw blades. It is also made with hi-density carbide to provide maximum durability and long life. The Hitachi 725206 72-Teeth Tungsten Carbide Tipped 10-Inch ATB is an ideal miter saw blade for crosscutting smooth and ultra-fine finishes onto wood. It can be used in veneer, decorative moldings, soft types of wood, hardwood floors, and even laminates. It has tungsten carbide tips for its teeth, and the alternate top bevel helps the blade last for years. It is even advertised to last longer than the traditional miter saw blades on the market. The Freud D0860S Diablo 60 Tooth Fine Finishing is a miter saw blade which is designed to grant the expectations of beginner, veteran, and professional woodworkers. It can be used for the construction and remodeling markets. It contains advanced laser-cut features like its thin kerf. While on the subject of its thin kerf, it is ideal to be used for portable and low powered saws to give them the extra "edge." It is an excellent choice for trim carpenters as it provides smooth surfaces with little to no sanding requirements. The DEWALT DW3128 Series 20 80 Tooth ATB is a miter saw blade with a thin kerf. While there are similar saw blades that share the same attribute, this particular model can still bring you smooth and fast cuts with this characteristic. What sets it apart from the rest is its Computer-balanced plate that allows for minimal to no vibration during operations. It also helps the saw blade to produce accurate cuts that might not even require you to do any additional sanding afterward. The Freud D1296L Diablo Saw Blade has a triple chip design with a thin kerf. With these features, it can cut laminate flooring, melamine, and double-sided laminates while leaving smooth surfaces. Furthermore, there will be no chipping or tear-outs. The blade also has TiCo Carbide tips to help produce razor sharpness when cutting materials, as well as giving the unit a proper level of durability to withstand many woodworking jobs. This particular saw blade is ideal to be used for 12-inch sliding miter saws and compact table saws. The SawStop BTS-R-40ATB 40-Tooth Titanium Series is a premium multi-purpose blade that can handle many types of woodworking jobs. It has a thin 1/8-inch kerf that can produce fast cuts and superbly smooth finishes. It has 40 tungsten carbide-tipped teeth that are razor sharp, and they give the blade the durability it needs to last a good long while. It is an ideal partner to have in any woodworking shop for casual to heavy users. The DEWALT DW72100PT 100T Ultra-Smooth Crosscutting Saw Blade is made out of premium micro-grain carbide. As such, it has the recommended level of durability it needs to help you meet the many demands of your wooden projects. These carbide teeth also produce ultra-sharp cutting prowess, and they can also significantly reduce splintering. The blade is also precision-balanced, which means you can enjoy accurate cuts without the wobbling and vibrations. It also has dampening slots to reduce any or all vibrations for enhanced cutting precision. The DEWALT DW3232PT Precision Trim 80 Tooth ATB Crosscutting Saw Blade offer high-quality micro-fiber carbide teeth that can reduce splintering for many wooden materials. These teeth also help the blade stay sharp for as long as possible. It is a crosscutting blade that has dampening slots found in multiple areas around its body. These slots assist the blade in reducing most, if not all vibrations during operations. It also means you'll get increased accuracy, as opposed to using a conventional saw blade. If you think you're all set to use blades with 60 teeth, then try a hundred. The Makita A-93734 Micro Polished Miter Saw Blade has 100 teeth to help you produce the smoothest cuts possible. It also has an ultra-thin kerf of .091-inches so that cuts can be made quickly and accurately. The blade also offers less drag as opposed to the traditional miter saw blade design. The teeth are also carbide-tipped to produce razor sharp edges while giving it the longevity you desire. 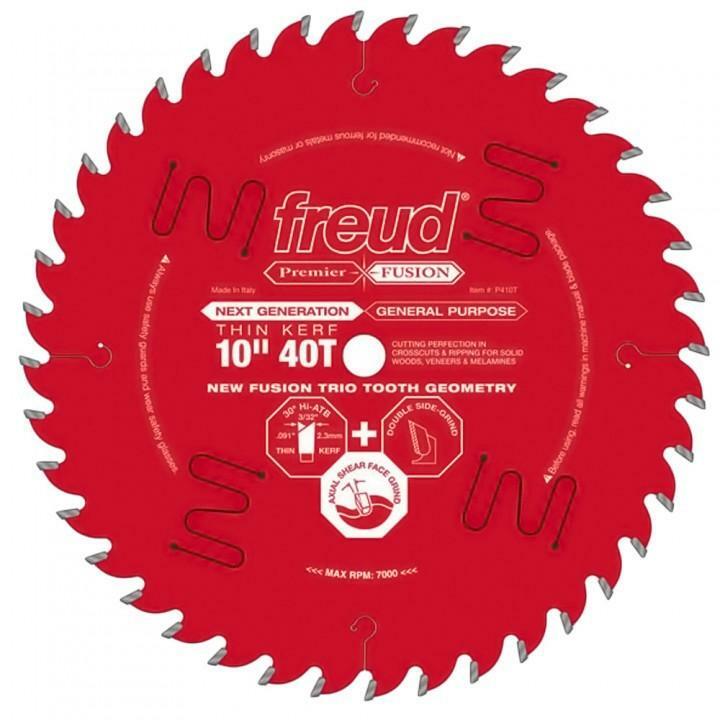 The Freud LU82M010 60 Tooth TCG Crosscutting and Ripping Saw Blade is made with precision, balance, sharpness, and durability in mind. This particular blade is made for cross-cutting and ripping through many types of wood. It can also handle cutting chipboards of up to 2-3/4-inches in thickness. The heavy-duty construction is laser cut, and it also has anti-vibration slots to make the blade as stable as possible during heavy-duty operations. Perusing around for the right miter saw blade for your needs as a woodworker might be difficult. Let the information posted here be your guide to selecting which model is the right one for you. When you have a high-quality saw blade, you can produce vibration-free cuts, smooth finishes, and faster-ripping prowess as opposed to using low quality or a conventional miter saw blade. If you haven't decided on a miter saw blade just yet, then you might want to consider the DEWALT DW3106P5 60-Tooth Crosscutting and 32-Tooth General Purpose 10-Inch Saw Blade Combo Pack. With it, you get two blades in one package, and you're also going to get a lot of benefits out of it. It can help you produce that cuts you require, and it won't hurt your spending allowance too much either. 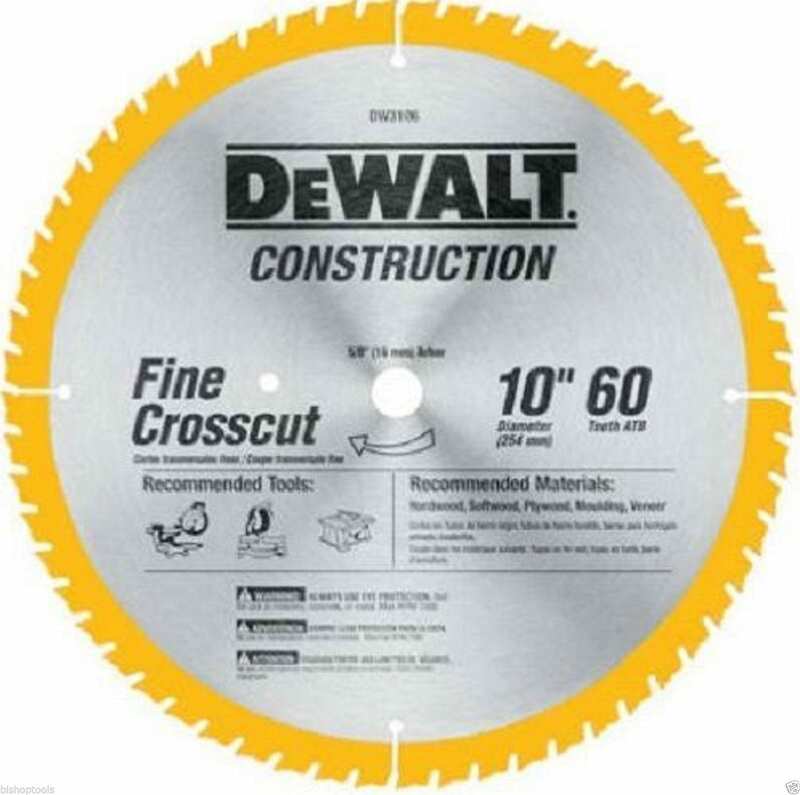 If you're interested in checking out this miter saw blade, you can do so by clicking here.